Are you searching for that one of a kind groomsmen gift to honor and appreciate the groomsmen on your special day? Your groomsmen and best man are your best mates as they help you celebrate the most exciting times in your life. For this reason, they deserve a thank you gift and what better way to show your appreciation than with a customized groomsmen bobble head. 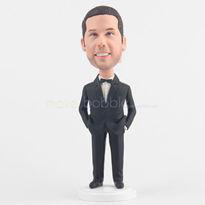 Groomsmen bobble heads are amazing and fun gifts to present on your wedding day. Besides, they are amazing gifts which guarantee to never be forgotten. Mbobble offers amazing bobble head designs for groomsmen. 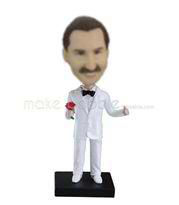 1- White suit groomsman bobble head. White suits are perfect for any event, particularly weddings. There is also nothing like a groom wearing a crisp white suit jacket. So, is your groomsman wearing an all white suit on your special day? Are you stuck on the ideal gift to surprise him? Well, you can surprise them with a personalized custom groomsman bobble head with his likeness. Also, wearing a white suit, brown tie, and black shoes. The bobble head also holds the jacket over the shoulder, which gives it a very fashionable style to its look. This is a nice gift as it will make the groomsman love his outer appearance. It will also make the groomsman remember your special occasion forever. Click here to view this awesome bobble head. Does your groomsman love wear tuxedos? Did he wear it at your special wedding day? Are you wondering on the perfect gift to surprise him? 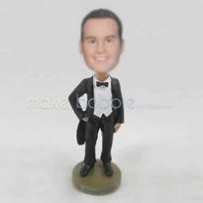 How about a personalized custom black tuxedo groomsman bobble head with his likeness. Also, wearing a tuxedo with a tail and a bow tie, with onto hands in the pocket. This gift will be quite sophisticated and elegant. It will also show your love and appreciation. Did your groomsman wear a white suit and black tie on your special day? Are you curious on what gift to you can give to show your appreciation? How about a custom groomsman bobble head with his likeness. Also, wearing a white suit and a black tie, holding a red flower in one hand and thumbs up with the other hand. This will be a unique gift and will show the groomsman’s unique style. Does your groomsman more casual and laid back? Did he wear a black suit on your big day and loves to his both hands in his pockets? If so, are you searching for a unique and perfect gift for him? Well, how about a custom groomsman bobble head with his likeness. Also, wearing a black suit with both hands in the pockets. Simplicity is key to a perfect look. This is a perfect and sophisticated gift for that unexpected exterior. It will also show your appreciation for him and his style. Do you want to honor and appreciate the groomsmen who helped you with your special day? Did they wear black suits on your big day? Are you stuck on the best and cool gift that will guarantee to remind them of this day? 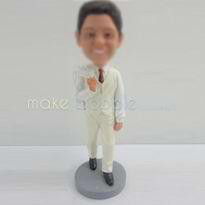 How about a custom groomsmen bobble head of the likeness of each groomsman. Also, wearing black suits and each putting one hand on the left side pocket. This will be a unique iconic and unique gift that will show their unique sense of style. It will also show your love and appreciation for them. In conclusion, groomsmen bobble head gifts are amazing gifts to honor and appreciate your groomsmen during your special day. A thoughtful and special gift always brings happiness and laughter. They are ideal, funny, quirky and memorable gifts from them as it serves as souvenirs of the big day for them. 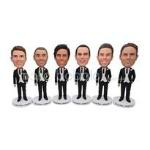 Check out mbobble for more stupendous groomsmen bobble head designs you can find and surprise your groomsmen today.